U.S. Secretary of State Hillary Clinton acknowledged on Monday that the United States and its allies are actively considering imposing a no-fly zone over Libya as a means to prevent Muammar al-Qaddafi's government from cracking down on rebel forces as the country seemingly spirals into civil war. There have been widespread reports of Libyan Air Force jets bombing and firing on protesters; rebels reportedly shot down a plane while it was firing on an anti-Qaddafi radio station on Feb. 28. Some 200 Arab groups from throughout the Middle East signed a letter over the weekend in support of a U.N. sponsored no-fly zone. How exactly do these zones work? La llave que abre todas las puertas, el petroleo. 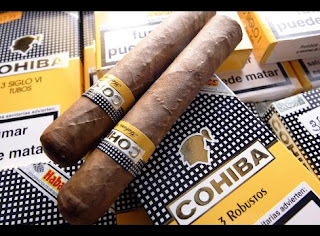 Se podrian disparar los precios de los tabacos cubanos si comenzaran a darse señales de un levantamiento del embargo.